Merry Christmas from the Oldfields. We have lots of gorgeous puppies available, right now. From teacup Toy Poodles to monster size Rottweiler puppies. Check with us for current availabiliy and photos. Boys, boys and boys. We still have 3 big, beautiful, well socialized male Rottweiler puppies available, plus 3 male Papillon puppies and 2 male Papapoos available. All super sweet and outgoing. Healthy, happy pups ready to join your family. Thanks for checking out our puppies, and hope to hear from you, soon. For anyone that has tried to gho on to my website in the last few months, I apologize for it being down. We are still here, still producing incredible dogs for your enjoyment! We had a bounty of gorgeous Rottweiler puppies, have 3 incredible males available. We have a beautiful litter of Papillon puppies available, several males, 1 female available. We have added some beautiful reds and deep apricot to our Toy Poodle lines. Can’t wait to see what they produce. Hope to hear from you, soon! I know it’s been quite a while dance my last update and I apologize for that but the puppies have been keeping me very busy! We have a gorgeous litter of Rottweilers and one male Papillon available. Toy Poodle and Papapoo puppies have been adopted. Don’t fret, we’ll have more soon. But please, check out the pups that we do have. We have been very busy here at Oldfield Outdoors. We have new litters of Rottweiler puppies, several males and females available. We have a litter of 2 male Shih Tzu puppies, going to be gorgeous. One is white the other is cream. We have one new litter of Papillons here, 2 males and a couple of more litters due, soon. We have a litter of Toy Poodles due, anyday. Time to book your 2015/16 hunting trip with Randy and have a great time on a gorgeous ranch with the chance of taking home a nice buck for your wall and doe for your freezer. Winter has finally hit Texas! We have precious, gorgeous, sweet puppies. We have 2 Papillon males, 2 Papapoo females + 1 Papapoo male and some new Rottweiler puppies. Male Rotties available that look like they are going to be REALLY nice! Time to book your fishing trips with husband/guide Randy Oldfield. As always, keep our military men and women and their families in your prayers. I wanted to ask everyone that looks at dog ads or craigs list, etc to keep an eye out for one Papillons, that was lost or stolen in Abilene, TX. Owners are beside themselves to have this little darling back. They were told a lot of stolen pets end up on craig’s list. 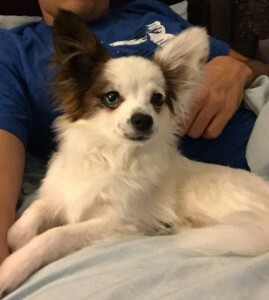 He is a very distinct looking Papillon, as he is mostly white, with the brown going around only one eye and very rare one blue eye. Photo attached her to post. If you see any suspicious ads that resemble him please contact us or authorizes. Just a quick hi to say Happy Holidays to everyone. Enjoy your Thanksgiving dinner and don’t forget to be thankful for all you have. Keep our service men and women and their families in your thoughts and prayers. Still have gorgeous puppies available. Make a great gift, any day or for an early Christmas present. Here in Texas it’s hard to tell, if this is fall, but I ain’t complaining! This weather is what makes so many people relocate to our great state. We have lots of gorgeous babies to fill your heart with joy. Give yourself or someone you love the greatest gift of all, one that reflects your love and can love you back. Gorgeous Papillon (Butterfly) babies. Beautiful little Papapoo (Toy Poodle/Papillon) babies and big, gorgeous babies, Rottweiler puppies. Whatever size you are wanting, from teacup to huge, we can match you with the perfect puppy for your family. Hunting season is here, call us and book a hunting trip and get a trophy whitetail for your wall and venison for your freezer. This is the time of year that I have a love/hate relationship with. Heat and humidity is tough to bear but we do it non the less every year. We Texans have to be tough. But please provide your animals with plenty of fresh cool water and if you haven’t tried it, a kiddie pool can really add to their summer fun, too. We have some Papillon and Papapoo puppies available and hope to have new litters of Rottweiler puppies, late Aug.
Come visit us and check out our puppies. Enjoy your summer vacations, everyone. Brenda, I just wanted to say thank you for everything! You have been the most kind, helpful and understanding breeder, I have ever met. I can’t wait to see Buttons and I will do my best in taking care of him. I had my doubts in buying a puppy online and sending you the cashier check, but everything went so well. Thanks again! I will try to send you updated pictures of him from time to time. I found Brenda Oldfield’s website three years ago when I was looking for a Papillon. It was important to me that I was dealing with a reputable breeder so I had been searching for months. Finding Brenda was a blessing! I was very pleased to see how she treated her pups like family. I could tell she was checking me out to see what kind of parent I would be as much as I was assessing the situation around me when I arrived to see the puppies. I could not have been happier with the results. My husband and I ended up with a beautiful black and white Papillon that we named Little Britches Jr., after his Dad! He is healthy and his temperament is so sweet. Brenda has always welcomed questions and has offered her assistance even years after we adopted our pup. We have been considering an addition to our family and I will not go to any other breeder except for Brenda! I recommend her to everyone that asks me about our Papillon. I was lucky to find such a wonderful Pap and such a good breeder! Troice J Mom of Little Britches Jr.